All big cities seem to have their own Spaghetti Junction. A confusing series of motorway on/off ramps, twisted and turned like a bowl of spaghetti. Auckland is no different. Shot again from the Sky Tower, looking down upon the city, I focused towards part of our spag bowl. Technically titled the ‘Central Motorway Junction’, Im not sure I have ever met anyone who has called it such. Without reference, my understanding is our spaghetti junction was built in the 1960’s to assist traffic flows and congestion in the central meeting point (CBD). When being built in the 70’s, it seems as there was some cost cutting, as I recall a number of pilons sticking up, going nowhere. I the 2000’s it was finally completed (or extended depending on ones position of opinion). Unfortunately for Auckland, and I am sure other areas of the world, a plan for traffic and traffic flow in the 60’s had no way of being able to accurately project 50 years into the future. The spaghetti may be well sign posted, but its still a muddle, and best to keep clear of any time around rush hour traffic…unless you want to more slowly and admire the engineering that is. And another shot from above tomorrow! 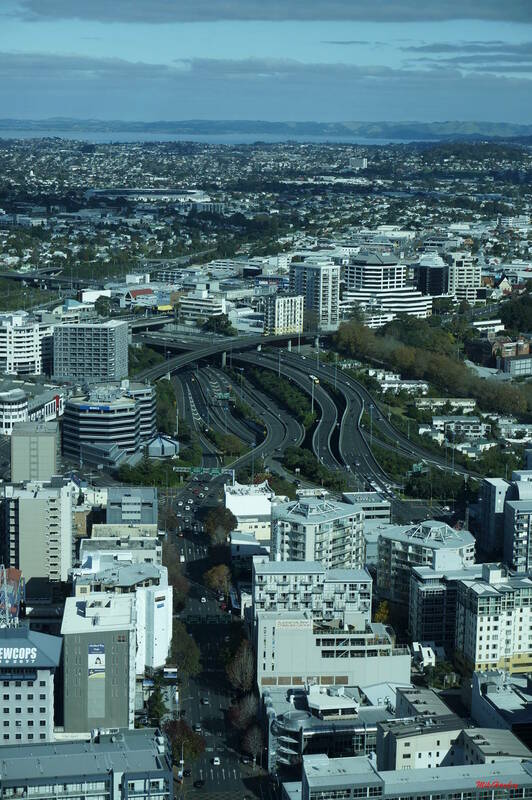 My favourite junction from the Sky Tower. It can get impressive during rush hour around 5pm!